Scholarships Make Students "Big Winners"
Forty-five years passed between the time Bill Taylor graduated from Illinois Valley Community College (IVCC) and the afternoon he stood before a gymnasium filled with a new generation of bright-eyed grads at their commencement ceremony. In the years that followed, Bill eventually managed to impress his former dean—and many others—as he helped make history in the financial world and changed countless lives for the better. Bill says that he and his wife, Dian, owe much of what they’ve accomplished to the people who invested in them. In return, they have given back to key institutions that have helped them along the way, including a generous estate gift to NIU that will continue their current scholarships and provide future strategic funding for the University. With his world-class NIU degree in hand, Bill’s next step landed him at Deloitte, one of the largest professional services firms in the world. After becoming a partner, he led the team that assisted with the first-ever multibillion-dollar leveraged buyout, a transaction that would forever change corporate America. After that, he led Deloitte’s effort supporting the buyout of RJR Nabisco for $30 billion, a transaction made famous in the best-selling book and film Barbarians at the Gate. In recognition of his many contributions, his partners elected Bill to the US and international boards of Deloitte. As smart financial minds, Bill and Dian were sure to maximize the impact of their gift. The Taylors’ estate gift does a great deal. For starters, it endows their much-needed scholarship support. 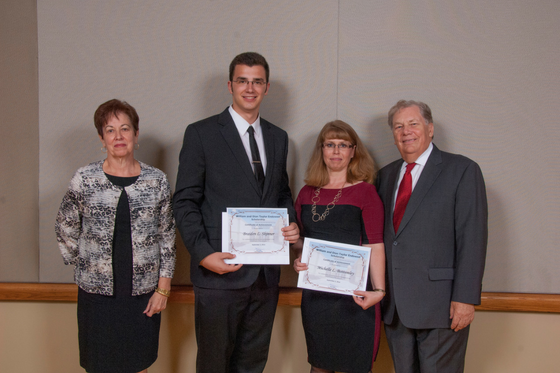 To date, the Taylors have provided 16 scholarship awards. only 14 percent of his or her expenses. And, as college costs rise, government programs to help students pay are becoming strained. Tyler Swanlund (’13), senior audit associate at KPMG, says he often reflects on the gift that helped get him through school. “It reminds me to always put in the extra effort at everything I do,” he says. Mandie Paterimos Ehret (’12) remembers well the motivation her scholarship provided. “I worked so hard and got all A’s and one B, and I was so happy to tell Mr. Taylor about that,” she says. Today, Mandie is a member of the marketing team at Mowery and Shoenfeld, LLC. The planned gift from the Taylors’ IRA also provides discretionary funding for University leaders to address pressing needs and seize promising opportunities as they arise. They hope other donors will help NIU navigate the changing environment of higher education with similar, unrestricted gifts.“Needs change as the University evolves. None of us know exactly what the University will need tomorrow,” Bill says. Currently, NIU’s greatest opportunity lies in recruiting and retaining talented, grateful students like Tyler and Mandie. Scholarships do just that. In fact, nine out of 10 NIU Foundation scholarship recipients graduate.